Things aren't getting any better for Morgan. The SeaWorld orca was filmed this spring hauling herself out of her tank to escape extensive bullying from her tankmates. And now, a report released Friday by the Free Morgan Foundation includes several photos showing the injuries Morgan has sustained from the other orcas' attacks and the conditions she's kept in. 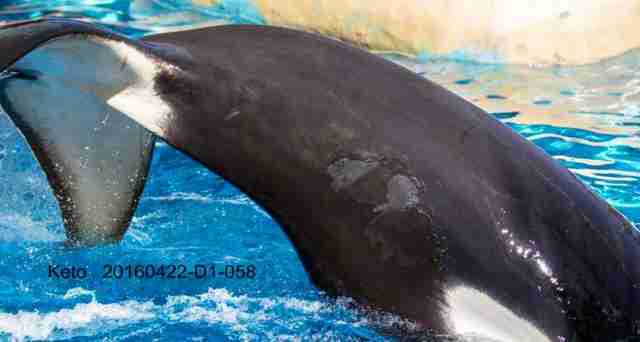 In one photo, she can be seen with deep rake marks from another orca's teeth running across her eye patch, as well as teeth marks on the white belly patch near her flipper. In another photo, she can be seen with what the research team described as "globules of mucus" streaming down from her eye, due to an unknown condition. Morgan is a wild orca who lives at Loro Parque, a marine park in the Canary Islands, with five other SeaWorld orcas on loan to the Spanish facility. Her time in captivity has been a short but sad one, as these photos show. In 2010, she was spotted swimming off the Dutch coast. She appeared to be ill, and the Harderwijk Dolphinarium captured her under the guise of treating her and rehabilitating her. But instead of being released, Morgan was transferred to Loro Parque in a series of shadowy moves critics have described as "orca laundering." She now performs regularly in Loro Parque's marine circus shows, and SeaWorld claims ownership of her. Since being taken into captivity, Morgan has been struggling - though SeaWorld and Loro Parque claim she is thriving. She is repeatedly attacked by her tankmates and also displays stereotypic behaviors - repetitive, meaningless actions that animals use to cope with the stress of captivity, and which can often lead to self harming. She has been spotted repeatedly banging her head into concrete walls. In an incident last month, Morgan was recorded hauling herself out of the water and beaching herself on the side of her tank, where she remained for at least 10 minutes. A second video soon emerged of a separate incident where she beached herself again; in this clip she appeared to have blood dripping down her chin. In a third video, an orca named Tekoa - a 15-year-old male at Loro Parque who was born at SeaWorld Orlando and is one of Tilikum's offspring - can be seen doing the same behavior. Like Morgan, Tekoa is a frequent bullying target, and the FMF researchers describe him as "one of the most 'raked' (bitten) orca in captivity, worldwide" - which can easily be seen in the bite marks covering his body in the screenshot below. The videos sparked international outrage, but SeaWorld and Loro Parque were quick to dismiss any concerns about Morgan and Tekoa's behavior, saying it's normal for orcas to leave the water in the wild. Those claims were roundly dismissed by critics. Ingrid Visser, Ph.D., a cofounder of the Free Morgan Foundation and a noted marine biologist who frequently observes Morgan and the other Loro Parque orcas, told The Dodo at the time that the behavior was highly unnatural and that the distressed orcas were likely leaving the water because it was the only way they could escape the aggression of their tankmates (orcas rarely fight with each other in the wild, but the cramped quarters of marine park tanks and other stressors make it a frequent problem among captive orcas). The report, coauthored by Visser and Rosina Lisker, a research assistant with the Orca Research Trust, was based on several years of observing and photographing Morgan at Loro Parque. It also raised concerns about Morgan's psychological welfare, noting that she's often distressed by Loro Parque's policies as well as the aggression of her tankmates. For example, on one visit the researchers witnessed Morgan locked up in the medical tank - a tiny side pool that measures only 40.7 feet long by 23.3 feet wide by 13.8 feet deep - with two other orcas as they waited on the sidelines during a show. At the time the water was only 11.8 feet deep; orcas can dive hundreds of feet in the wild, and Morgan herself is 16.7 feet long, meaning she couldn't even go head to tail in the tank. A few days after the above photo was taken, a video emerged of Morgan appearing to panic while held in the small medical tank, flailing around and banging her head over and over into the heavy grate that separated her from the main tank. According to the FMF researchers, Morgan was likely stressed by the small size of the holding pool, which greatly restricts the orcas' freedom of movement and has the added discomfort of a floor that can lift at any moment, pulling them out of the water altogether. "Loro Parque consistently uses the medical tank as a holding tank during shows, which places unacceptable physical and social stressors on the orca," the researchers wrote. "These vivid actions of Morgan [in the video] clearly indicate acute elevated levels of distress ... anyone with even the most basic understanding of animal behaviour can recognise that the thrashing, strident calling and smashing into the gates is far from 'normal', 'natural' or even a 'trained' behaviour." But Morgan is hardly the only SeaWorld orca who's suffering. As The Dodo previously reported, the report also found that many of the orcas were losing their teeth and had scars on their jaws from chewing and swimming into their tank walls. 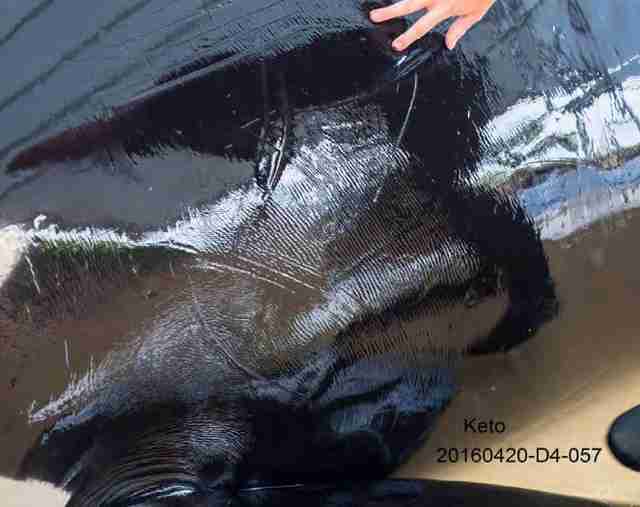 And Keto, a 21-year-old male who was born at SeaWorld San Antonio before being lent to Loro Parque, appears to have a number of skin conditions, as highlighted in the report. 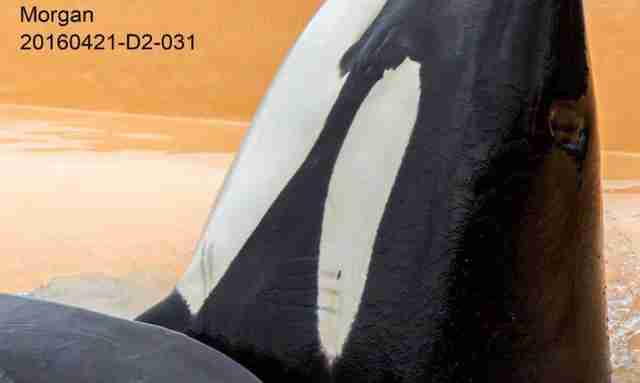 One photo of his saddle patch - the white mark that straddles an orca's back behind his dorsal fin - shows mysterious pockmarks of unknown origin. He also has what appear to be lesions on his side. He also has rough, wrinkled skin both under his dorsal fin and on his side, due to an unknown skin condition. The researchers also reported seeing rake marks on several other orcas besides Morgan. Of course, these latest photos are in addition to dozens of others, published throughout the years, that show all the SeaWorld orcas at both Loro Parque and its U.S. locations are suffering from rake marks, self-harm or any of a variety of physical and mental symptoms. 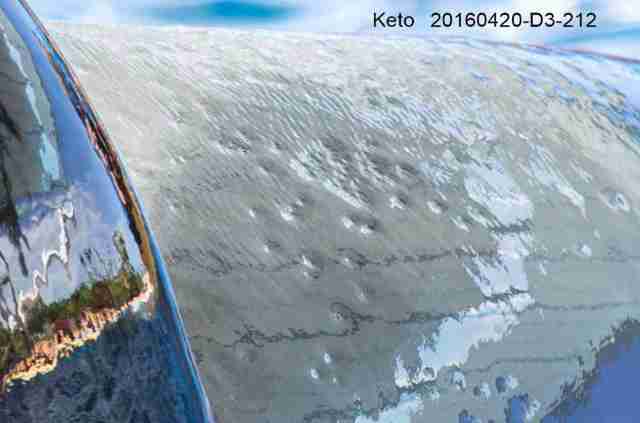 For the researchers, these latest images only reinforce what critics have known for years. "The holding conditions at Loro Parque are substandard and indicate gross negligence," the FMF team wrote. "The welfare indicators observed in relation to Morgan, the only wild-born orca held captive at Loro Parque, highlight how extreme the situation is." You can read The Dodo's additional coverage of the report, which also found that several of the orcas were losing their teeth, here. If you think Morgan and the other SeaWorld orcas deserve better, click here to find out how you can contact SeaWorld and Loro Parque. To help the team fighting for Morgan, you can make a donation to the Free Morgan Foundation here.